Breyer®, the maker of the world's finest model horses, has brought to life Spirit from the all-new DreamWorks series Spirit Riding Free! Breyer's Traditional series portrait models are known around the world for their beauty, quality, and true-to-life details. Noble, proud and unbreakable, Spirit is a wild mustang who builds a special friendship with a girl named Lucky. Spirit is 1:9 in scale, 8.25"H x 10"L, and was sculpted standing proud and free. 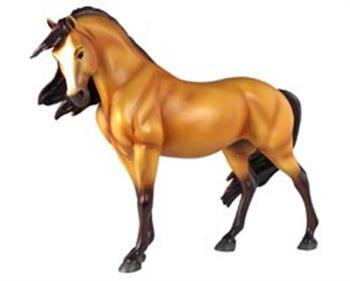 Each Breyer Traditional model toy is hand painted, so no two are exactly alike! Made for a lifetime of enjoyment, Spirit's highly-collectable model is perfect for hours of imaginative play!